What is better than mixing Quilting and Cake??? Join us for this new style BOM… Take one Layer cake, 5 yds background, and some Cake Mix Recipe papers = a unique Sampler Quilt. 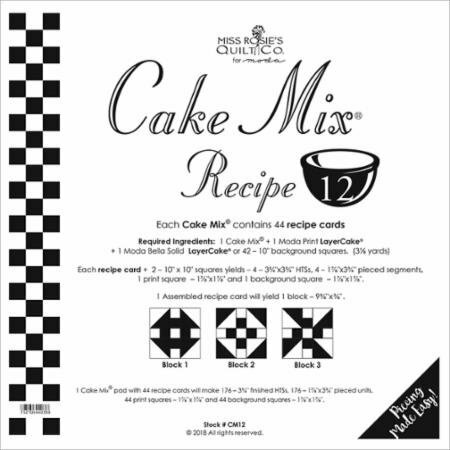 Each month packet you will receive the Cake Mix papers, a unique pattern to make a quilt with that months Cake Mix, Block instructions, and a recipe for a yummy cake. (The last month you will receive patterns of different layouts to finish your quilts) $3.00 to get you started and if you bring your finished block to the next month demo you will get the next packet free!! And of course we will be serving cake as you get to watch our demo!! !